Sensuality - physically pleasing - sense. Analysing the word sensuality, we extract the core word sense and look to it. There are 5 senses - sight, touch, hearing, smell, taste. We chose to work with the sense of taste as a part of the living architecture.Who doesn’t remember the Grimm’s story of Hansel and Gretel and the witches house? Every child has imagined this house, built of candy, overed with cookies and lakritz. We interpret this edible architectural fairytale in our proposal for an installation. The idea is a simple square pavillion.The structure consists of lattice walls, built with wooden beams. The lattice openings are filled with bricks of cotton candy. This material is easily formed and sculptured and ideal as a facade filling. The colour is not the typical cotton pink, but a dark purple one - a reference to the lavender fields of South France. As seen from a distance the material can not be defined by the visitors, so an element of suprise occurs. The pavillion has small openings, so everyone can peek inside of it , and there is one big opening, used as an entrance. 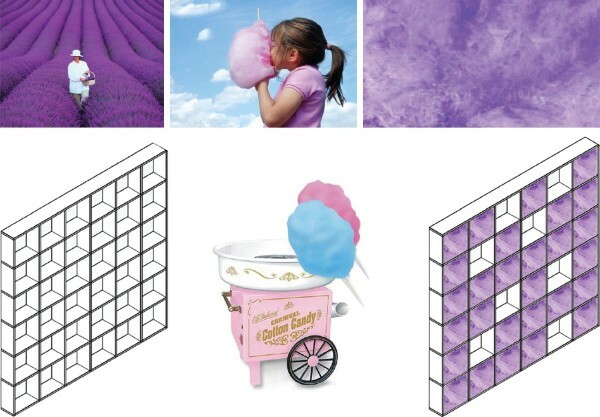 In the center of the installation there is a cotton candy machine,where every visitor can make its own candy cotton , taste the material and use it to refill the openings of the wall, if needed. The smell of fresh cotton candy and sugar surrounds the installation and inflame the senses.